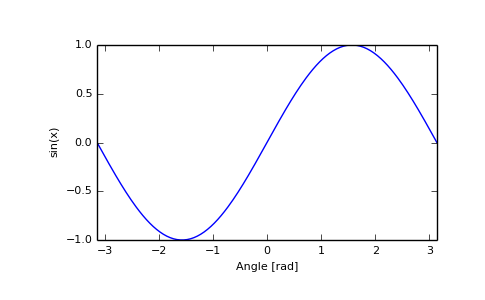 Angle, in radians ( rad equals 360 degrees). The sine of each element of x. The sine is one of the fundamental functions of trigonometry (the mathematical study of triangles). Consider a circle of radius 1 centered on the origin. A ray comes in from the axis, makes an angle at the origin (measured counter-clockwise from that axis), and departs from the origin. The coordinate of the outgoing ray’s intersection with the unit circle is the sine of that angle. It ranges from -1 for to +1 for The function has zeroes where the angle is a multiple of . Sines of angles between and are negative. The numerous properties of the sine and related functions are included in any standard trigonometry text.